Today’s post is dedicated to my dear friend Joan of the blog Chocolate Chocolate and More. Last week, my sweet friend Joan passed away of a heart attack in her sleep. She was in her late 40s and still so full of life. This tragic event has left me, the blogging community and of course her family in devastation. She left behind 3 cute kids, which as a mother of 3 myself, complete tugs and pulls at my heartstrings all the more. Her death came as a complete shock and to be quite honest, I am still in shock about it. Joan was such a tremendous part of the food blogging community and was always the first to extend her hand in her knowledge and friendship. She was such a kind person and really made it a point to make everyone feel like a good friend of hers. Its so crazy to me, that someone I have only had online interaction with through this crazy blogging journey, could become such a dear and wonderful friend of mine. Joan was among the greats and will be terribly missed by all who had the privilege of knowing her and by those who enjoyed her fabulous recipes. With today being National Chocolate Day, the food blogging community only finds it fitting to post a yummy chocolate recipe in dedication to our incredible friend. From her blog name, Chocolate, Chocolate and More, It is pretty obvious Joan was huge fan of anything chocolate. Which is why I want to share with you my FAVORITE and GO TO recipe for Chocolate Buttercream Frosting. Chocolate is my true food love. I was shocked I hadn’t yet shared this wonderful recipe with you yet, but am honored to be able to share it with you today. You are going to LOVE this recipe! I hear you totally. I was sadden to hear of Joan's passing. Even though I knew her only thru her blog, she felt like family. I read a couple of blogs, and I really feel like they are part of my family. They teach me, enlighten me, and share wonderful stories with me. 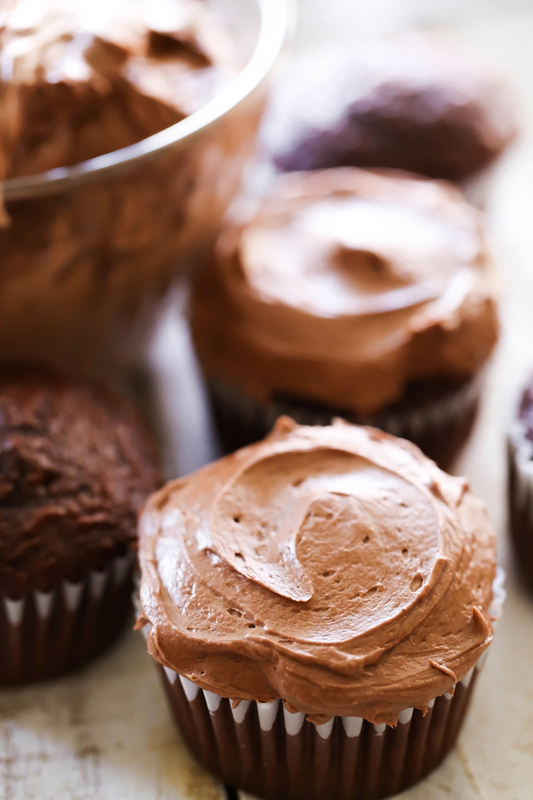 Thank you for sharing the chocolate butter cream recipe. I could eat the whole bowl by itself. Hope you have a wonderful day. Yes it can! Just thaw in the fridge and it's ready to use. I always double the recipe and freeze half to have on hand. Very sorry about your friends passing...42 is very young and such a loss....my heart goes out to you. Joan really did touch countless lives, didn't she? This frosting looks perfect and I bet that she would have happily eaten it with a spoon. She was an amazing friend. I love seeing so many posts remembering her. I am so sorry to read about Joan! Love her blog and her wonderful recipes so thanks for dedicating this to her. Buttercream frosting would have been right up her alley and something I would have expected to read on her blog. Thanks for sharing this! So useful as it's my husbands Birthday today and I need to make a cake pronto!!!! I'm going to try this! How long can I keep this before I use it? Thanks in advance. I would like to ask heavy cream? Any particular brand of heavy cream? Or can I use al purpose cream? This tastes like powdered sugar. Not a fan. Thanks for sharing this and condolences on the loss of your friend. Prayers for her family. This looks amazing. I want to make some cherry chocolate cookies for V-day and I think I might have to try this icing!! Thanks for the recipe! BTW your pictures are amazing, what kind of camera do you use? This tastes just like my mom's frosting. Thank you! Sounds good will try it. Thank u for sharing. Will this recipe frost a 9" two-layer cake with a Tip 21 she'll border or should it be doubled? Can't wait to try this I think it will be tomorrow lol Thanks . I made this buttercream frosting and it came out beautiful, and its so easy to make. Thanx for sharing ? Thanks so much for this recipe! It's perfection! I love it!!!! I made it for a going away party, big hit!!! Best recipe ever!!! This was my first time trying homemade frosting and I loved it! I will not go back to canned ever. This was super easy and delicious. Thank you. I can already tell from the ingredients how good this will be. In search for a go-to chocolatr buttercream. I am definitely whipping this up for my next batch of chocolate cupcakes! Thanks! And my condolences on the passing of your friend. Fluffy, easily spreadable, and delicious frosting. Thank you for the recipe! I do have to say I never leave comments but this frosting by far is the best buttercream frosting my husband and I of ever ever had it almost taste like the brown sugar frosting my grandmother used to make on her sheet cakes ! It is absolutely amazing !!! My frosting did not stiffen enough to stay on the cake. I made this and it was awesome! I used Chocolate milk (whole, not 2%) instead of cream. Aaaahhhhmazing! This frosting is absolutely delicious! We only used part of it on the cake and ate the rest right out of a container in the fridge. This will be my go-to chocolate buttercream recipe! This is sickly sweet and barely tastes like chocolate. Super disappointing. Tried to rate it 1 star, but it only selects all five stars when I click on the stars. FYI my son who is 11 just made this,he forgot to add the vanilla and salt,it still came out good,sweet but good lol.This was a very simple recipe and it made a good a mount for a 2 layer cake. 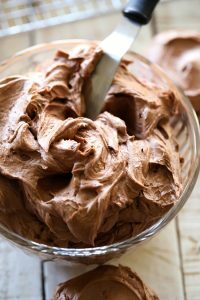 One of the best chocolate frosting mixes, I have come across.it was like velvet. My husband loved it on a yellow cake (his favorite). So I came across this recipe. It is awesome. So at 10 o'clock at night I made this .Thank you. I only used 2 cups of powdered sugar and it was enough with great taste! I think 4-5 cups would be way to much but I suppose it depends on your preference and taste! I would reccomend trying 2 cups then adding more if wanted. Is this recipe good for 24 cupcakes?? This frosting is amazing!! Perfect for my batch of cupcakes and so easy to make! Plus almost always have all the ingredients on hand! Thanks so much! Made it, loved it, and the recipe is now the one I will forever use for chocolate buttercream frosting! I would have a picture for you, but they disappeared almost as soon as the cupcakes were done! Very easy, (which I require), and very yummy. Thank you so much for posting! Do you have to store this frosting in the fridge? I also thought it barely had any chocolate flavor. I doubled the amount of cocoa. Mine was from Trader Joe's; perhaps using 100% unswetened cocoa like Hershey's or Nestle's would be better than using Dutch-processed. It was still good, but I'd prefer more chocolate flavor in my frosting. For the butter can it be any kind?? And does the brand matter??? Need to be kept in fridge since has milk in it? Can this recipe cover and fill an 8 inch cake ? Or should it be doubled ? Can you use buttercream instead of heavy cream or milk? This frosting is the best one I ever made not too sweet just right.? Delicious! Quick and easy. I didn't have the cream so I used 2% milk and it's still fabulous frosting. Thanks for the recipe. Oh yah...our new "Go to" chocolate frosting. And oh boy, did I ever whip that butter until it was the consistency of Cool Whip!!! I am trying this frosting because it looks delish and sounds so easy. Hello. Want to make this frosting for my nieces bd. But it's a 3 layer cake. Should I make it. 1 1/2 ? This is AMAZING I used this on some cupcakes and topped it off with chocolate chips. So yummy! Wow! This frosting is so amazing. By far my favorite chocolate frosting I have EVER made. I used 3.5 ups if sugar instead of the recommended 4.5-5 and it worked out perfectly. This is my new go-to! This is a SUPER easy frosting and quite delicious. I accidentally put twice as much cocoa powder in it, and it still turned out great. I'll be making it again. Loved the frosting, sorry for your loss. I lost someone dear to me last year so I know how you feel. I came across this recipe and oh my goodness it is so easy and so delicious! My family and I have gotten into this bad habit of thinking we need brownies every Sunday. Last week for Father's Day, I decided to add something special - FROSTING!! Your recipe just made the brownies that much more delicious. The Sunday brownie tradition will not be going away any time soon. Thanks for the deliciousness! Wow! This really is the best frosting! So light and fluffy! Not to mention flavorful! Perfect for icing a cake! I hate to give a bad review but I didn’t think it was possible to not like frosting, but this is so unappealing to me- tastes mostly like powdered sugar and not chocolatey. Made it for my sons bday party and regret it as I used all my ingredients. I’m sorry but I don’t recommend. Don’t let anybody tell you otherwise-this buttercream is perfect!! Amazing! Middle of the road sweet. Used 41/2c powdered sugar, 4 Tbsp cocoa, 5 Tbsp milk. Made some damn good cupcakes!